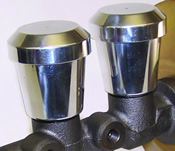 The ECI remote fill master cylinder system can be mounted to the ECI street rod booster in place of the standard Corvette master cylinder. This system allows the master cylinder and brake system to be filled without getting under the car or removing the carpets. The dual chamber remote mounting reservoir can be installed under the hood, in the trunk or any other suitable location (above master cylinder level). This allows ease of filling, quick fluid level checking and eliminates the need for a hole in the floor. System comes complete with new master cylinder, remote mounted reservoir with aluminum mounting bracket, master cylinder filling fittings, clamps and special brake fluid compatible rubber hose. Price listed below is an additional charge applied to all ECI booster systems. Manual system does not include booster. Note: This system requires a m/cyl. pushrod guideplate. Call for details. These second generation billet aluminum reservoirs feature a new tapered body and cap design featuring screw on covers with an internal vapor barrier. 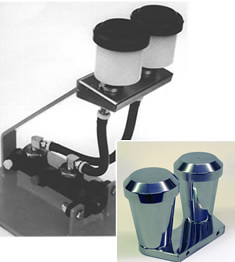 Kits come complete with an aluminum mounting bracket and are available in either two or three reservoir configurations.